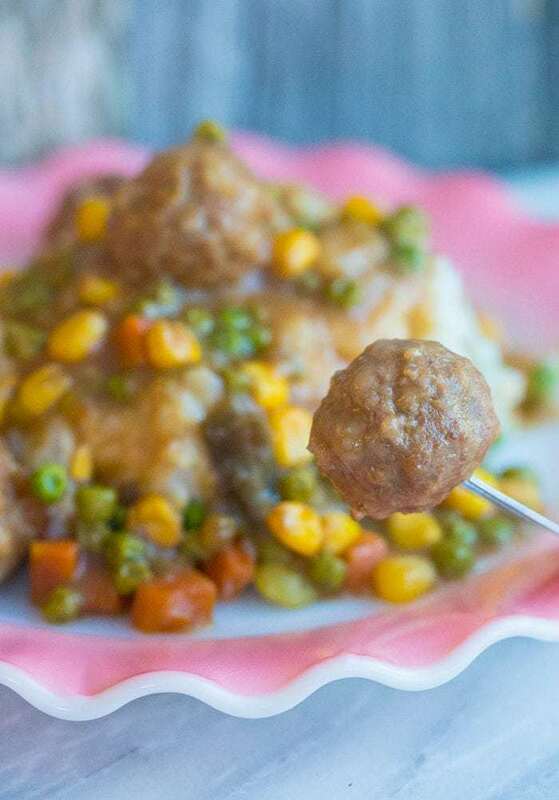 New favourite supper recipe alert – we LOVED this Crockpot Meatball Shepherd’s Pie! I know, I know, everything I share here on The Kitchen Magpie is a great recipe, the ones that don’t make the cut-off don’t ever see the light of day. BUT… this recipe is a cheater recipe, so for me to get excited about it really means something. We have been trying to use up everything in the pantry and the fridge freezer before we head on on a Mexican cruise with my entire family for Christmas and I had a farmer’s field worth of potatoes to use up in the pantry before we left. I dug in the freezer and lo and behold, there were frozen meatballs – Mike’s favourite thing to make when I’m not home and he’s solo parenting/feeding the kids. I prefer my sweet & sour meatballs to all else, but when Mom’s not home, Dad still has to feed the twerps. So. I had meatballs, mashed potatoes and a bag of those assorted frozen veggies that I love in my How to Make Easy Fried Rice Recipe.If you haven’t tried out that fried rice I highly suggest you do, now, because that is my favourite supper ever. Mike & I have been eating it since we dated! I digress. So when you put those three things together : meat, potatoes and those veggies? Crockpot Meatball Shepherd’s Pie, of course! I knew right away that I had to make it into a video before I left as well to share with you all on social media as well. This was way too easy to make. The hardest part was cooking the potatoes – and I’m sorry there is no substitute for fresh potatoes but if you really wanted to, you could use the dry fakes. I won’t judge. The meatballs however are easy, you just use your favourite frozen brand! You could make your own for sure, but you would have to fry them up and drain the grease. 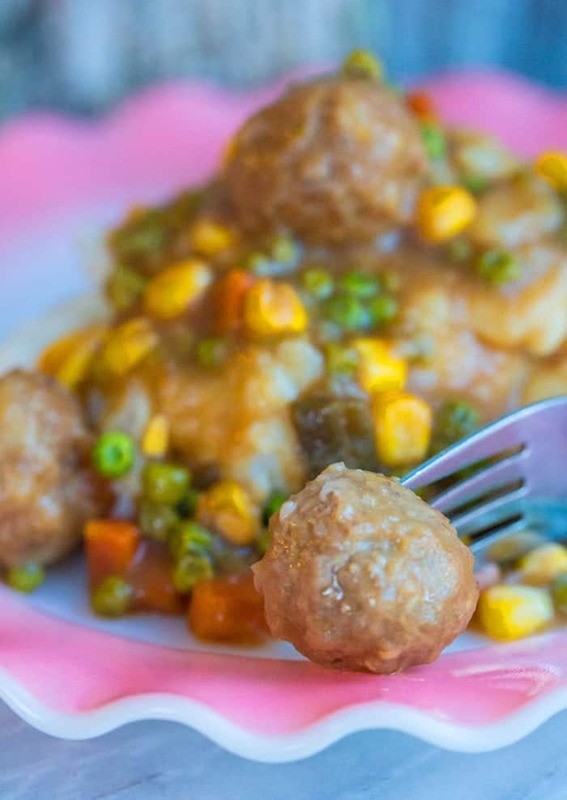 By using the already made meatballs there is less grease in this dish and only deliciousness! You can totally change this up if you want to your liking. You can make homemade meatballs, fry them slightly, drain and use them instead. You can change-up the vegetables. You can add cheese- something I also love on shepherd’s pie. This is just giving you the basic delicious recipe and you can customize it as you see fit! 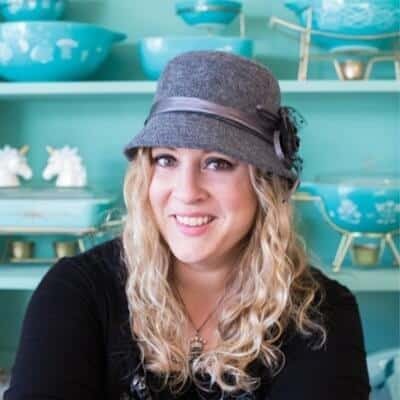 Pin this recipe to your SLOW COOKER RECIPES boards & REMEMBER TO FOLLOW ME ON PINTEREST! 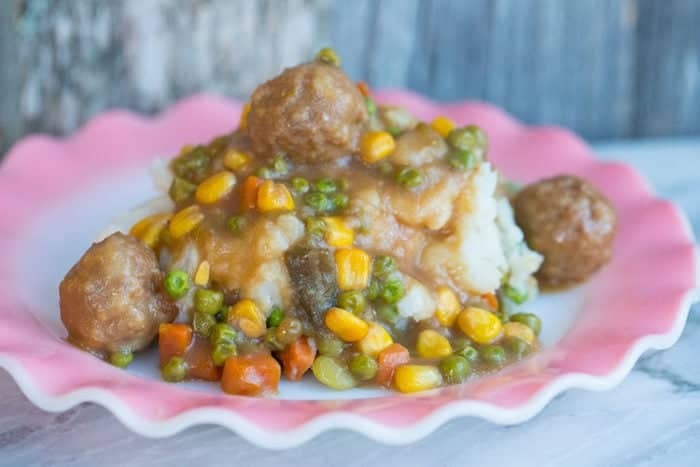 This Crockpot Meatball Shepherd's Pie is sure to become a new family favourite! It cooks all day and you come home to a delicious meal in your slow cooker! 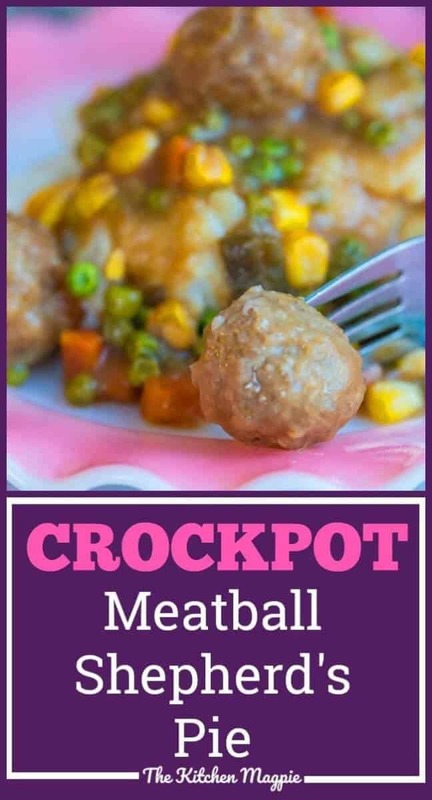 Place the meatballs in the bottom of the slow cooker. Whisk together the gravy mix and the beef broth. Pour over the meatballs. Place the vegetables in a layer on top of the meatballs.Top with the potatoes. Cover with foil, place lid on top and cook on high for 3-4 hours or low 6-8.